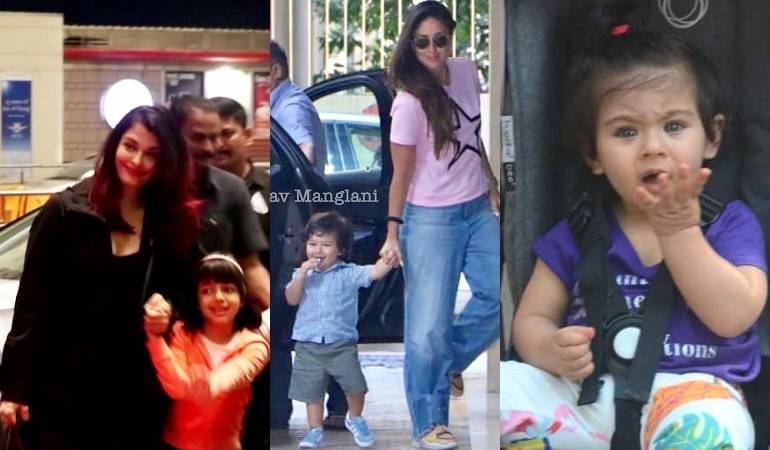 It's just been a few hours that Taimur Ali Khan and his cousin sister Inaaya Naumi Khemu landed in Mumbai, and the brother-sister duo is already making headlines. The little munchkins had gone on a trip to the Maldives with their parents and after spending and enjoying on the Island, they are now back and strolling on the streets of Mumbai. This evening, the two stepped out, while Taimur looked very excited the moment he spotted his papz uncles, Inaaya looked confused. Taimur along with his mom Kareena Kapoor Khan visited his Masi, Karisma Kapoor's home and Inaaya was spotted on an evening stroll. Yesterday, when Aaradhya Bachchan was leaving with her mommy Aishwarya Rai Bachchan, she too was very excited and all smiles for her favorite paparazzi uncles.